Some buyers just start earlier than others! 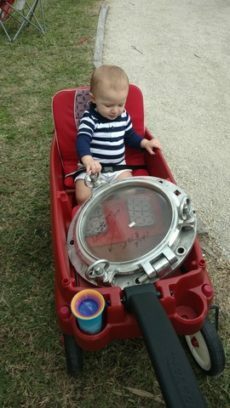 While working one of our many nautical flea market operations, this little guy had to have one of our authentic polished aluminum portholes for his collection. Mom and Dad handed over the money, and they had one happy buyer riding the rest of the day in his red wagon. We may make it look and sound easy, but getting the salvaged brass nautical lights off salvaged vessels and back home is no easy job. I just never have the room in my checked bags to fly it all home the next day. The game is much bigger around here – we bring home several tons on each trip, and even when you do it right, things still go wrong, and nothing ever gets here when we expect it! Many of you would give almost anything to be in my back pocket on a day like this!! After several days of traveling and some less than desirable Bangladeshi food, I am ready to go see the lights that are ready to be removed from this retired car transport vessel. I will point out a few interesting facts out the beached ship behind me. First of all, it has been carefully cut in half. The fresh marks in the beach sand still show the drag marks left by a massive section of steel that is now missing. When I say missing, it was gone! Cut up by hundreds of workers just before we reached the project. Check out the ladder leaning up on the side of the vessel. It was made of bamboo and rope, and must have been 25 feet tall. This was our only access to this beached vessel, and the climb up was no fun. Each layer or deck of the exposed ship was designed to park hundreds of newly built cars. The removed cargo was not special, but we salvaged hundreds of those smaller ceiling lights you see normally listed in the Small Lights category of our website. Mike Whiteside from the DIY TV Show “Salvage Dawgs” stopped by for a visit some time back. Mike owns Black Dog Salvage in Roanoke, VA. We had a great time giving Mike the grand tour our warehouse operation here in Pauline, South Carolina. Mike has a lot in common with us – he will travel down even the smallest of roads looking for that stone that has yet to be turned over in hopes of finding a new treasure. Mike left with a few treasures, and I hope our paths cross again! I was able to recover some old website photos. These two photos always generated some of the best comments! I picked this load up at a shipyard in Jacksonville, Florida and hauled it to our old warehouse in northwest Indiana. I never put a yard stick next to it, but the guys loading it claimed this single piece was over 4,000 feet long. Two things I AM sure about: The dry weight was over 3 pounds per foot, and it was not dry when I hauled it home. I am also sure that someone was looking over me on that 1,000 mile drive back to Indiana. I watched several cars pass me on the interstate and then slow down and start taking pictures of the large rope that could have easily been mistaken for a large tropical snake. Along the way as I fueled the over worked truck, many curious on-lookers had to walk over and touch the rope – it was truly a site to be seen. Our good friend from the Rope Locker in Felton, Delaware even made the trip over to Indiana so he could get a section of this large rope. If you are looking for a piece of this large rope, I am sorry to tell you it is all gone. Apparently a lot of people wanted a short piece of this large rope. Come on in, let’s see what they have to offer today! This vessel was recently intentionally beached for a complete salvage. Each shipyard has its own way of getting items off the vessel and up onto the beach for sorting. This was a rather interesting start to this project; they were lucky enough at high tide to get ample speed to drive it this far up on the beach. Piece by piece everything that can and will be salvaged is pulled out of this massive 5 story opening. Yes, it would not be uncommon over the next few days to see compasses, brass lights, the dinner dishes, and even the kitchen equipment carried off the vessel by hundreds of workers. The hull of the vessel is dark, dirty, and full of hazards caused by the salvage operation. With the right eye, we will carefully select the cargo we will reclaim on a project this size. Here is a shout-out for my good friends Jim and Kathleen. They own The Rope Locker over in Felton, Delaware. Jim may be a salesman in the eyes of a normal person walking past, but the truth is, he is a talented craftsman. Jim may sell rope from his traveling workshop, but he can and will splice rope to make custom dock lines. Not to be confused with the spliced rope lines you see sold in plastic bags, he starts with good rope and his pride in ownership of the final product is like a work of art. 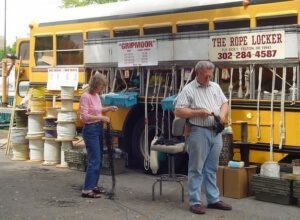 If you need rope, call Jim at 302-284-4587, and tell him you spotted him on www.bigshipsalvage.com! Honey, where did you park the boat today? This photo was taken a few miles up the beach from one of the big international ship breaking yards we visit. No, we do not bring these back to the shop, but it was such an interesting photo I wanted to share with you. 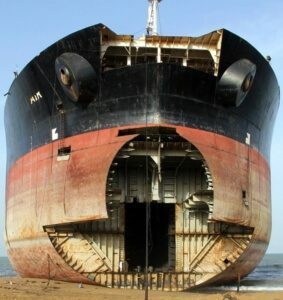 Every day a new vessel arrives at one of the international ship breaking yards. Nothing goes to waste. 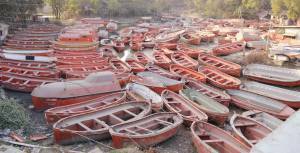 The reclaimed life boat shells end up being used by the coastal fishing crews in mostly third world countries. The make good working vessels, as they are built to withstand some of the worst conditions.